As Search Engine Marketing is a crucial component of many digital marketing plans in the mobile age, having solid mobile SEM ad copies is becoming more and more important. In this post, I will share 14 best practices for Mobile SEM ad copies. We won’t talk about messaging strategy as it would take a lots of space to talk about both of these topics together. If you want to know more information, you could refer to my ebook about “Search Engine Marketing in the Mobile age“. 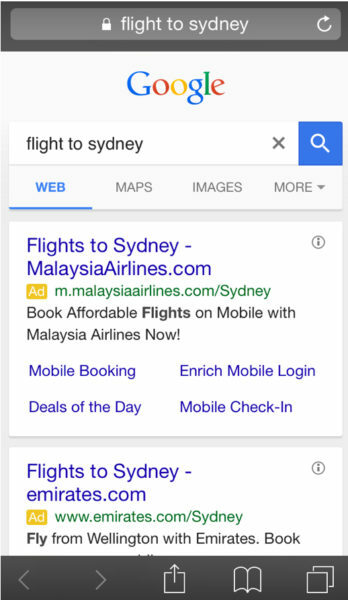 First let’s talk about how typical SEM ads look like on different mobile devices? 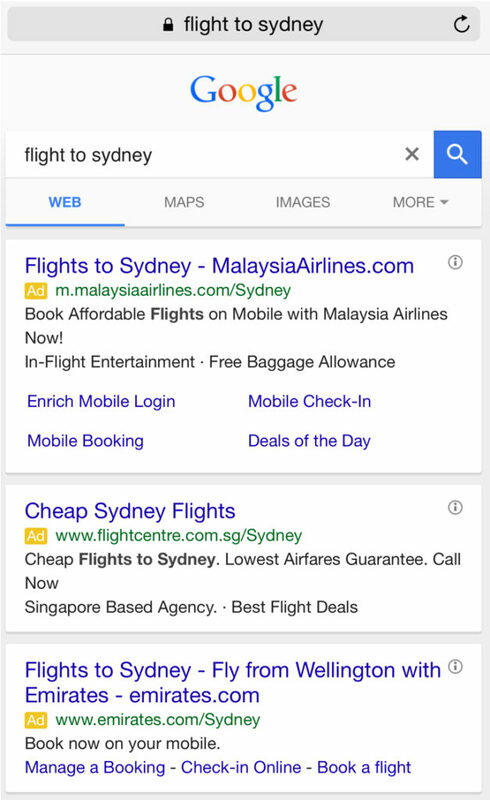 1.How do typical SEM ads look like on mobile devices? 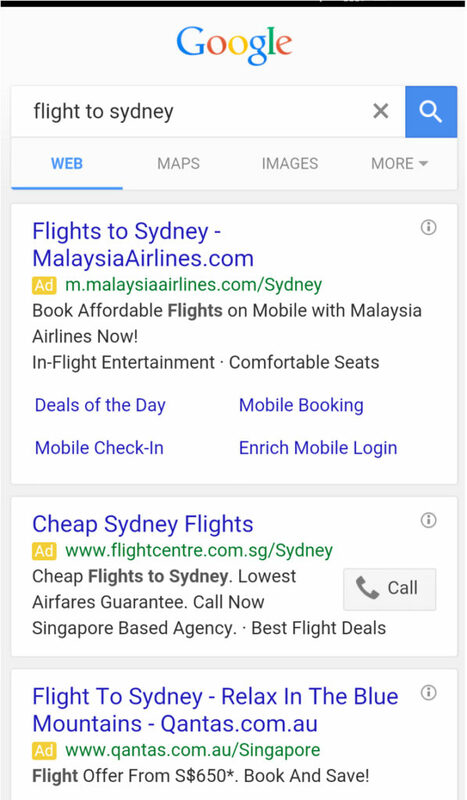 Unlike with desktop/laptop, on mobile devices, there are maximum 3 ads on top of the page, and then you will see organic search results. At the bottom of the page, you may see SEM ads again. Below are three examples for different phone models and screen sizes. The first one is for iPhone 5. As you could see, without scrolling down, the first two SEM ads occupy the entire above the fold phone screen. The second example is for iPhone 6s with 5.5 inches screen size. You could see 3 SEM ads also occupying the entire screen above the fold. Again, you couldn’t see any organic search results without scrolling down. This last example is for samsung galaxy, with screen size of 5 inches. Similar to iPhone 6s example, you can’t see organic search results here either without scrolling. 1. Include keyword in your ad title and/or description line 1. This will help to improve Click through rate (CTR) and Quality Score (QS). 3. Use mobile preferred ad copy. Don’t use the same ad copy for both desktop and mobile because on mobile, your description line 2 may not appear always. The explanation from Google is here. It’s important then to include most critical information or even call to action on your headline and description line 1. This happens when the system thinks that your ad would perform better with just description line 1 and sitelinks or other combination. 4. Longer headline: take advantage of longer headline. As you may know, on desktop or mobile, Google system may automatically combine your headline and description line 1 to make a longer headline. This obviously could improve your CTR quite a bit. Again what it means is that you would need to put a complete thought for headline and your description line 1. You could also consider schedule your sitelinks since different time of the day, prospective customers may be able to interact with your brand in different ways. 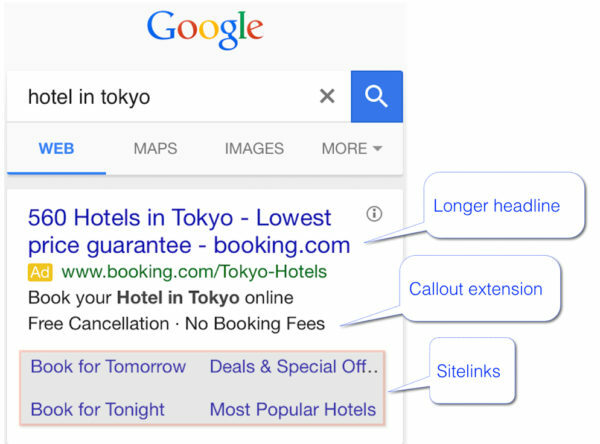 Create at least 6 different sitelinks since the Adwords system would automatically selects the best performing ones to show. This will help to increase the chance of success. 9. Callout extension: It’s a given that you should use call out extension on all campaigns. It would help to make your ad copy stand out more and improve CTR. 13. Automated ad extension: there are other automated ad extensions like “Consumer ratings”, “Previous visit”, “Seller rating” etc… that you could try to influence as well. 14. App download & App engagement: Google has separate campaign type to support app download or app engagement objectives so please think carefully if you decide to use App extension instead of a dedicated campaign type. Only use App extension if your primary objective is Not app download. That’s about it for now. If you want to know more information, you could refer to my ebook about “Search Engine Marketing in the Mobile age“. Very useful – thank you Chandler.